You see, most people don’t like change – but I welcome it. I decided to meet this new neighbor of mine while he was hosting an outdoor party. Come to find out, he was like a lot of “Floridians,” a European who owned property in Florida while still residing in Europe. “I don’t understand,” he first said. “How is it that the stock market, the bond market, and the U.S. dollar are all going up? That’s not supposed to be, right?” he added. Think about it for a moment. Our economy might not be growing at a blistering pace, but it’s outpacing the world right now. World headlines are rife with recessions, energy crises, and tales of raging insurgencies and wars. All of which push fearful foreign investors toward U.S. stocks, U.S. treasuries, and the U.S. dollar. 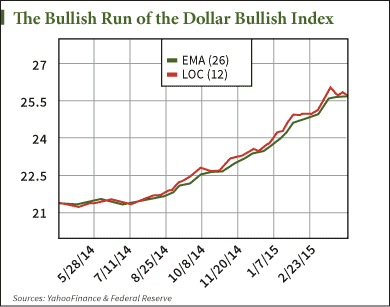 And many investors believe that the rise in the U.S. dollar hasn’t reached its peak potential yet. PowerShares’ Dollar Bullish Index was created to offer leverage in various assets, and I think for currencies they make sense since we see little day-to-day movement of them.